Secure Profile Management provides secure, personalized access to communications applications and corporate data on any IP phone. Capture user information, validate it against an organization’s identity management system, and grant users appropriate access to: communications applications, extension mobility, directories, and vertical–specific applications. When combined with any third–party ID reader, SPM enables multi–factor authorization—barcode, RFID, magnetic cards, biometrics—for the encrypted exchange of information at the edge of an IP network. Link your identity management system with your telephony infrastructure to provide secure authentication and policy enforcement through IP phones. 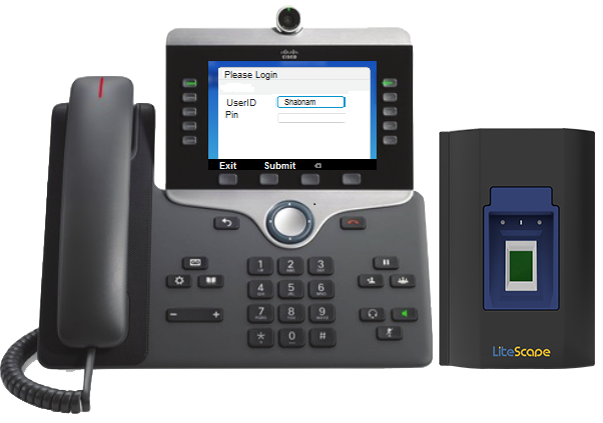 Grant users customized access to applications and data on any IP phone in your network. Integrate with presence systems to securely track users and their access to corporate information. Access secure extension mobility throughout your enterprise, regardless of type or number of PBXs deployed. Guarantee users get access to only authorized applications. Unify distinct technologies—including identity management systems and PBXs—and enable them to work together to maximize security. Enable employees to clock in and out of IP phones, while recording data in your existing time management software. Allow customers to scan items and review product information from inventory management systems.